Miguel, could you tell us a little bit more about you? I am living in South Florida. I have a City job in community services division. Hobbies include karate and swimming. So, your career began in 1990 under the label Afecta Records with the first song “Remember the days” by Full Afekt (you were the lead singer of this band from Philly). How did you get involved in this project? Yes, I was the lead singer. Robert (Pacheco), Bobby (Rodriguez) and Larry (Webb) wanted to start forming a group and I met them through a mutual friend, and I was told they were looking for a lead singer. I sent them a demo when they heard my demo I got involved and that is when “Full Afekt” was born. What was the part of each of them inside Afecta Records? Bobby was the engineer, Robert was also involved in the production (assistant to Bobby), Larry was the DJ, and I the singer. During the Afecta Records period, it was also the birth of an another terrific singer: Sammy Cazio Roman. How did you meet him? I met Sammy through one of his friends who worked at a record store. Is it by chance if both of you did start your career the same year, but not on the same label? (PS: Sammy C sang and produced in 1990“In your eyes” on his own label Hot Streak records)No. In my opinion I think it was a great experience for the both of us and brought us together. The end of the year 1992 marks the release of your next title “Don’t leave me now” but also and unfortunately the ending of Afecta records. What happened to Afecta records? Everyone just decided to go their own way. Why? Costs, no distributors, it was too much for us to handle on our own. Why did you make this kind of “retirement” between 1993 and 1994? I took time to write, practicing my craft, and waited for an opportunity. At the end of 1994, it’s your come back as a solo artist with this wonderful gem “Those were the times”, and also your first single with Tazmania Records. How was this tune born and how has your collaboration been with this productive and excellent label from Philadelphia?Sammy was signed to the Label and guided me in talking to the producer – as I understood it at the time, they were interested in me and that is how I got involved with them. “Those Were the Times” was just a song that was created during my “absence”. Your song “Those were the times” has been a hit during a big part of the year 1995. What were your feelings about this success? I was very, very surprise, I never expected that any of my work would ever become a success as “Those were the times” did. In your opinion, why did people react so well to your track? The song “Those were the times” is a type of song everyone from any age can relate to, that’s why the song did so well; it was a different type of approach. Many people discovered your amazing and unique voice. When did you start practicing? And through the years, did you feel the necessity to improve your voice?I’ve always loved to sing since a very young age. It wasn’t until high school when my teacher discovered my voice and basically guided me in the right direction. There is always a necessity to improve ones own voice. I think I have done some improving.Is it true that if you pursue a singing career it is due to your music teacher Charles Paul?Yes. He saw something in me that I didn’t see and he helped me bring it out. This person seemed to have a big influence on you? Yes. Mr. Paul was not just a teacher. He was a good friend. Also, in 1995, you were nominated “Hottest male vocalist” for the “Freestyle awards” (DMA magazine). How can we react to this kind of recognition from the professionals and especially from the Freestyle fans? I was surprise considering the competition. Yet it is good to know that there are “professionals” and fans out there that look out for new talent. Year after year, you’ve stayed faithful to Freestyle music. I don’t think that i’ve stayed faithful to it. I think that I just haven’t been able to re-direct myself to a different style of music as of yet. Why did you choose this music to start your career? I grew up during the peak of the freestyle area, and was inspired by the new sound, which I later continued to pursue. I just love to sing it relaxes me and makes me feel good and happy. It’s a gift the God has given me. If you hadn’t begun a singer career, would you have finished as a Karate champion? Am I right… or is Karate just a hobby? I have only been good at only two things in my life and that is music and martial arts. When one of my favorite hobbies fail, I have another to fall back on. Do you prefer to be considered as a Freestyle or as a Dance music artist? 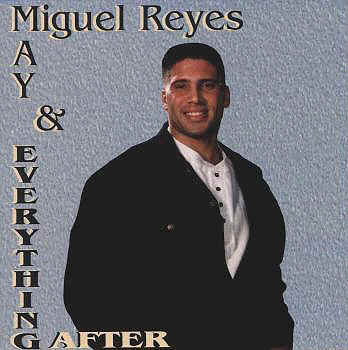 In May 1996, it’s the consecration of Miguel Reyes with the release of your splendid album “May & everything after” on Tazmania Records/Metropolitan Records.Yeah that was my sweat and hard work all put into that album.Why did you write or co-wrote yourself most of the songs featured on your album?Actually, I wrote most of them all except for 1 or 2. I wrote them on my own because it was my goal to take freestyle to another level with my form of writing. Why did the release of this album take so much time? This album was completed in September 1995, right? It was the record company, when the song “ Those were the times” got dropped from the play list on B-96 from Chicago, Metropolitan Records decided not to release the album. What they should have done was promote the 2nd single “Someday” as a follow up to “Times.” The release of the album was due to an article written of myself on DMA, which gave Metro a bad reputation as a label. They really did not have much of a choice. I owe special thanks to the writer, Doug Bump. If it weren’t for him there would not have been an album. Could you let us know about the photo collage on the back cover of the CD? It was of my friends and family and all the people that were behind me since day 1. I wanted them to be apart of what I was experiencing and going to experience. I’m sure that at this period Tazmania producers were very proud and happy to release your album. But at the same time, I was very astonished by the stupid decision made by Tazmania Records or Metropolitan Records (I don’t know!) 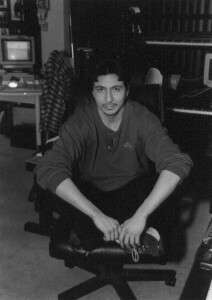 to release your next two singles “You’re my everything” and “Because of you” on some EP editions which featured other Freestyle artists from Taz. Do you think that it’s the best thing to do, to promote your talent and album? I wasn’t too happy with the EP idea, but at that time my opinions and concerns did not matter to the label. Why did you decide to leave Tazmania Records? It was time to move on to BETTER and new things. After you said goodbye to Tazmania Records, what did you do? I got married and had a family. I put music on hold for just little bit. In 1998, you were supposed to release “Feel like the first time” (produced by JJ Flores and “Tim Spinnin’ Schommer”) on Throb Records, a label located in the suburb of Chicago. Why was this project miscarried? I have no idea what happened! At one point, Freestyle was great then totally died in Chicago and I think that was their decision on putting the project to the rest. Did you need a freethinker after this failure? No, I needed to get connected with the right people and only the way to do that was by taking time to pick and choose the right projects and only SERIOUScontenders. At this precise moment, what was your look on the Freestyle music business? After this new absence of 2 years, Miguel Reyes is back in 2000/2001 with a Progressive Freestyle remix of “Those were the times” available on the awesome compilation “The SBP Product” distributed by Silverback Records. What were your motivations to re-release this hit 6 years after? We were trying a new wave with a new generation. How did you get in touch with Silverback Records’ producers? And why did you accept to work with them? Who was your main influence? My lord and savior, Jesus Christ. What is your “all time” favorite Freestyle song? I don’t have a favorite song. I enjoy listening to songs that just don’t sound cheesy. C’mon Miguel, don’t you really have any favorite Freestyle song? O.K, one of my all time favorite freestyle song would have to be, “In the name of love,” by Charlie Babie. What his your favorite style of Freestyle (Latin Hip-Hop, Progressive Freestyle, etc.)? I will always be a fan of old school freestyle, but for the freestyle market to survive it has to change even the title freestyle has to change it needs to be taken to another level. Most radio stations play the old school stuff, the only people that benefits off old school airplay are the publishers not the artist. We are in the year 2001, I think it’s about time to make a change in the dance market. Over 10 years, what is your best and your worst souvenir in Freestyle music? The responses I still get from the fans. My worst is not seeing any royalties of my past work, while everyone else still is. In your opinion, why has Freestyle music become an underground music? Because it doesn’t get airplay. Do you have any upcoming projects for this year 2001, a new single for instance? Perhaps, we are taking it at one song at time. What do you think of the current Freestyle scene and market? I am not sure what is being played in other States, but here in Miami it’s all old school. You don’t hear too much of the new school. What is the future of Freestyle music? It has to change and be taken to another level. There is no future for freestyle. The old school era is gone, as we get older we change same applies in music. Trance, and Progressive is actually the new market for freestyle, it’s just a different tittle no one wants to hear or use the word freestyle anymore. The change has already been made to Trance, Progressive, and disco house. I would like to make it more inspirational and motivated and not so much heartthrob. What advice or message would you give to future artists? Learn the business of music first and don’t ever sign anything without lawyer. Do you have any particular message to give to the Freestyle community? Stop hating, and start playing. Thanks for all your support it has been greatly appreciated, love and peace and have a great 2001.